On August 15, 2015, Vonda Johnson, President of Local 2696 put together Akron’s first Regional Bowl-A-Thon at Bill White’s Lanes in Springfield Township. The social event brought together over forty union members and their families for a night of bowling, food and socializing. AFSCME Council 8 members from locals in Stark, Summit and Portage Counties participated in the family gathering. The idea came through discussions on the importance of bringing locals across the Akron Region together to network, socialize and show unity. The event was a great success, and has already generated interest in future socials. AFSCME Local 2696 member Jonetta Johnson Bell has proposed an AFSCME movie night. Many of the Council 8 members brought their family members, including their siblings and children. While no one kept track of the high scores during the bowling, it was clear there were a number of excellent bowlers among the crowd. Social events such as Akron’s Regional Bowl-A-Thon demonstrate that we are active in our union for more than just the fair pay and benefits we fight for. Being a union member is also about standing up for our families, and building the communities we want to live in. 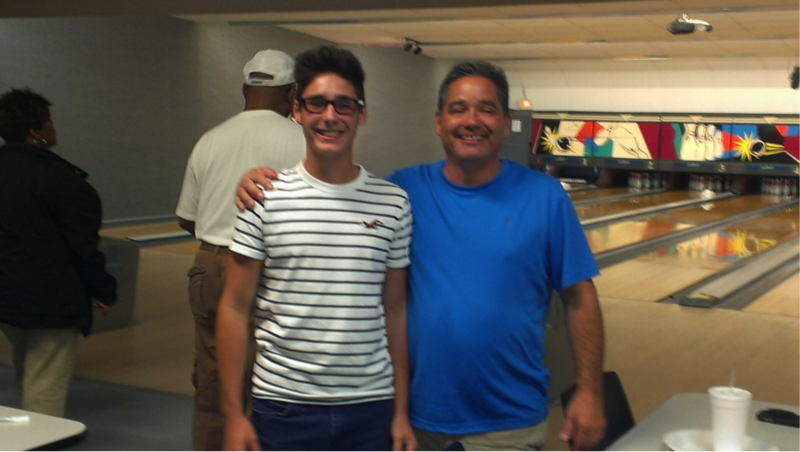 AFSCME Council 8 member Adam Artimez and his son Alex pose for a photo during the Akron Region Bowl-A-Thon.